Retired ICL/ICT staff in Kent and Surrey, should be aware of this groups meeting dates. "West Kent Reunion Group Meetings"
My wife and I have, between us, spent over 67 years working in the computer industry, things have changed, over the years. Here are just a few historic notes, which may interest you. Remember this was the past from which the existing computing world as we know it grew. Only 35 years ago, to change a part in a computer you had to switch it off , and wait 5 mins for it to cool down, or you got burnt fingers, cos' the valves were still too hot. ( HEC4 ) ICT 1201 computer = my first REAL computer, ( I was allowed to fix the peripherals ) A Senior Tabulator, modified to read 80 column cards into the 1201 store, and provide printed output. Also a modified Card Punch/ Reproducer, which provided Punched card output under software control. The machine was located in Morganite Carbon's London Factory, Battersea area. And the company produced graphite products from there, so there was a lot of carbon dust around. The machine was a dual beat, serial data, valve machine, with a drum store, of about 1024 x 40 bit words, which I seem to remember was located in the Console. Now valve machines use high voltages, carbon dust is a good conductor of electricity, so it goes without saying, that we had quite a few problems with this machine. Simon Buxton, has donated this superb picture of a 1201, thank you Simon. Simon also has a site with a lot of technical information about this elderly, but ground breaking, machine. See the link below. 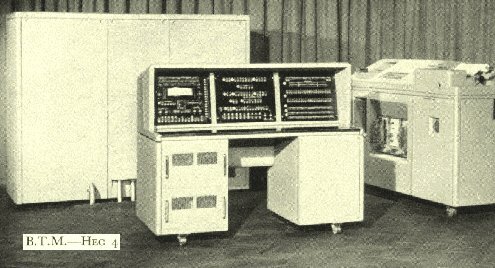 The BTM / ICT 1201 computer. "Simon Buxtons home page and information on ICT 1201 "
Michael Milsom has kindly allowed me to link to his site for more 1301 pictures, so visit him to see what happened when these machines, when they were scrapped, they continued to turn up on TV, Bond films and even Dr Who. "Michael Milsom's Great Collection of ICT 1301 pictures"
Eric Foxley also has a picture of an even earlier 1301 computer. This was a prototype as installed at ICT Putney bridge house. See it at the nottingham university Computer history site. IT is picture No 34 on the page linked to below. "Eric Foxley's historic 1301 picture"
Approx. 7352 Germanium transistors, ( and one single valve) used to produce a lot of heat, and if the temperature got too high, the resultant problems caused, would take a lot of hard work to locate. 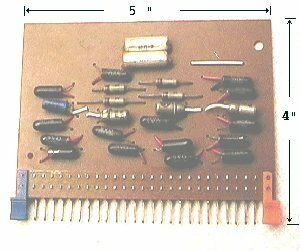 Printed circuit boards were not pluggable, so when you thought you had found the duff board all you had to do was, power off, remove up to 25 wire wrap connections, replace the board, remake up to 25 wire wrap connections. Then you crossed your fingers and powered up again. Simple wasn't it ? Speed = 1mhz Clock, Processing was 4 bits wide, serial 12 digits, 3 primary data registers, plus 3 control registers. All the arithmetic functions were in decimal format, with an alternate set of functions for processing Pounds, shillings and pence. Program storage was 2 thousand 12 digit words of fast, 'Immediate Access Store'. This was ferrite core store and with twelve digit words this equates to 12 kilo bytes. Program Store was on Drum with twelve thousand words of Drum storage, again the 12 digit words make it Seventy two Kilo bytes of Drum, which could provide overlay techniques for program area's. This machine shown also has 4 one inch magnetic tape units each with a storage capability of 1.5 million twelve digit words approx, around Nine Mega bytes of storeage. Input Output was on punched 80 column cards with 600 line per min printed output. 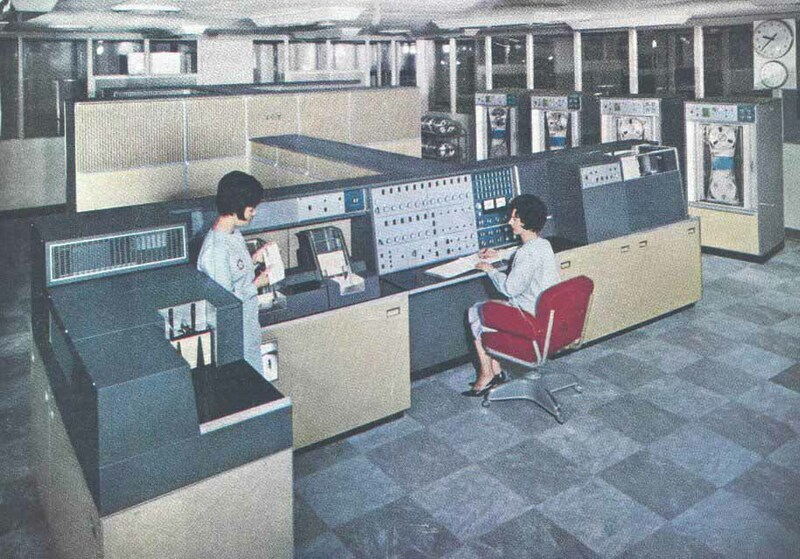 Typical work for this type of machine was to do batch processing, of large datafiles held on magnetic tape, although some alternative applications were attempted. No assembler was used by the programming staff, this was a direct machine code driven beast, or computing in the raw. For news of the 1301 Resurrection project, see the dedicated news page. 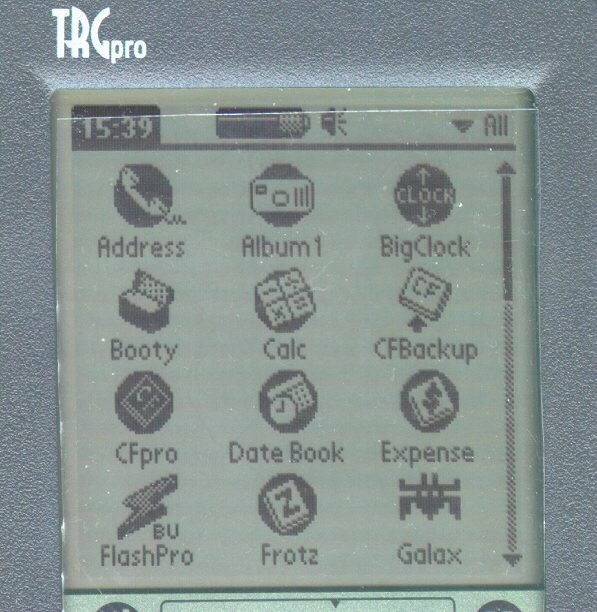 Modern Computer = Palm TRG Pro=16Mhz CPU, 8Mb store, 128mb Compact Flash file area, runs off 2 "AAA" cells, for months at a time and above all, fits in the pocket. 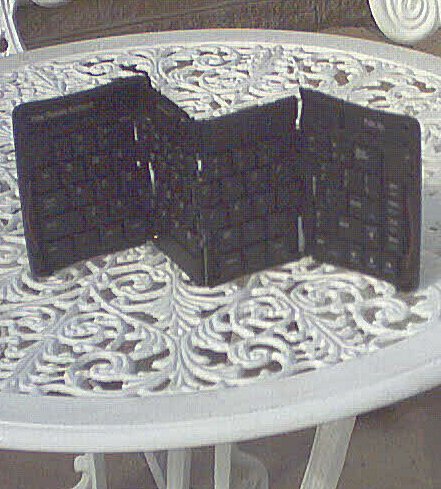 Carries all my Emails, Ebooks, and even Music. Most of the images on this site were produced by a Kodak Palm Pix Camera which uses the TRG as both its control and image store, I also can strongly recommend the Keyboard, which folds down to pocket size, it has accompanied me on three cruises now. This is what Computers were meant to be.